This painting features a Siren - a ship wrecking on the rocks in the ocean behind her - her song and mythical beauty draw the sailors near.... This painting is for another oracle deck project, this deck is all water-themed, being written by my two sisters Kachina Glenn and Amber Logan & being published by Blue Angel Publishing. 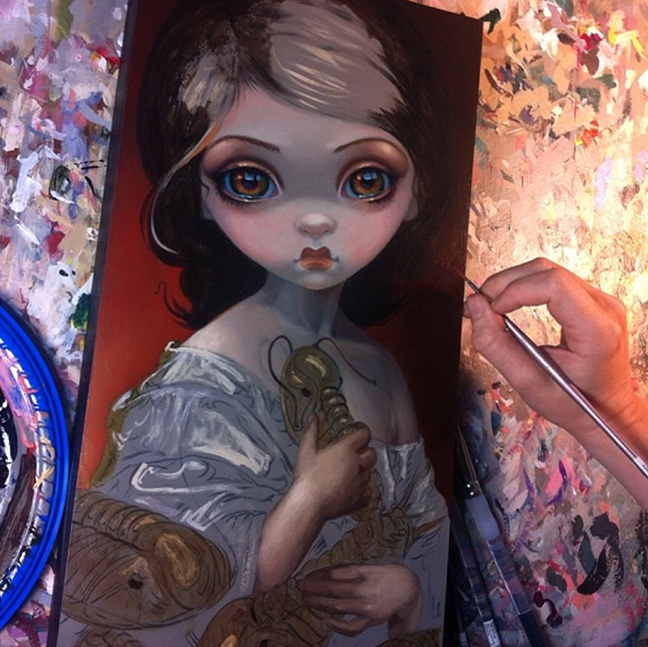 The original painting herself is sold, but I have prints, posters & other merchandise available! Additional signed prints of her will be up in our StrangelingEmporium eBay store and Strangeling Etsy store as soon as Amber & Chris get back home from vacation ;) In the meantime, simply order from strangeling.com and your order will get in asap to be shipped when they are back home! Lt. Ed. Canvas prints will ship immediately. A piece I did for a themed group show at Seattle's Eight and Sand Gallery called "Red" - this darling girl has a red masquerade mask (made of facepaint, judging by the bit she's left on her finger!). This is my own original acrylic painting, the original was sold at the show, but prints, canvases and merchandise are available! Still in progress, but we are taking collectors' names for those interested in the original painting! 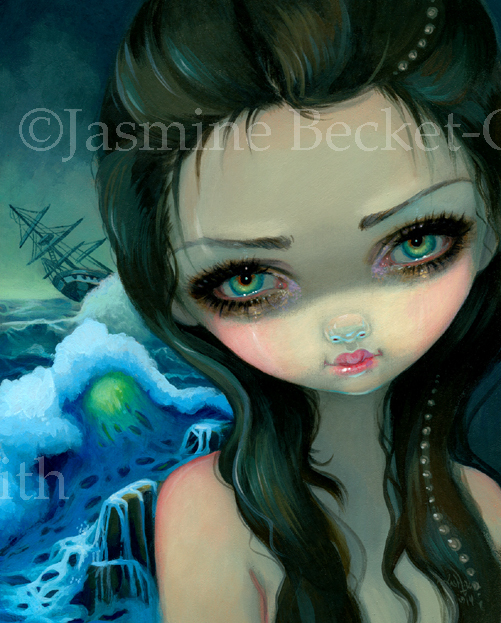 Click HERE to email Jasmine to let her know you may be interested in purchasing the original. Work-in-progress! This painting features one of my favourite creatures - trilobites! I collect their fossils, and enjoy painting pictures of them. This beauty loves them too - this painting is for another oracle deck project, this deck is all water-themed, being written by my two sisters Kachina Glenn and Amber Logan & being published by Blue Angel Publishing. If you are interested in the original painting, contact me at JasmineToad@aol.com - I am taking names for the "first dibs" list for direct sale from me, the artist. This original painting is acrylics on a 16x8" panel, will come gallery cradled on 2" deep glossy black painted birch cradling, ready to hang, and will be priced at around the $3300 mark depending on how long it takes me to finish. Collector inquiries will be given preference based on chronological order of contact, be sure to email me directly at JasmineToad@aol.com (don't respond to this post as I will probably not see it) and put "Interested in Trilobites Original" in the subject line. To see other available original paintings click HERE.